Iraqi Muslim exiles protested against Radical Islam in Germany this week. The sign on the main link says in German = ‘Wahabisim is the well of terrorism’. 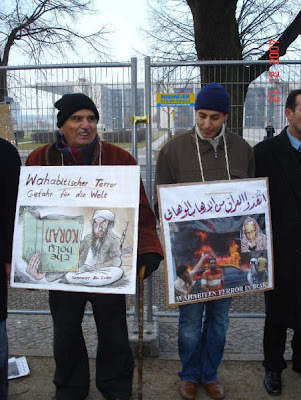 Iraqi-American Haider Ajina passed this news on of a anti-Wahabi protest in Germany this week. The Arabic text refers to the protesters coming out in sub zero temperatures and condemning the Wahabi sect, its injustice and blood shed in its name its fatwa’s and condemning the Saudi Government for cradling Wahabi terrorism and its scholars who declare murderous fatwa’s. This protest received much support form passer-bys. The organizers of this protest sent a letter to the German President, Chancellor and members of the German parliament. The German (as you know my Mother is German hence I speak the language) text of the letter appeals to the German Government to put extreme pressure on the Saudi government to stop supporting the terror and blood shed being called for by fatwas of Wahabis and to declare these fatwas illegal. The letter also declares Wahabisim as a particular extremist radical disturbance in Islam. Wahabisim is a state sponsored movement in Saudi Arabia. Wahabis declare all non Wahabi Muslims to be unbelievers (most Muslims in the world are no -Wahabis) and thus must be terminated. Wahabis with the support of the Saudi government are spreading their message of hate and killing in their schools. We want to tell the world of the terrorist danger of this movement which through its teachings sprouted Alqaida to which already have fallen many victims of terror in New York, Bali, Madrid and London. German Chancellor and members of parliament receive memo condemning Wahabisim’. In their first protest outside of the German Parliament building (Reichstag) in temperatures below zero. They have been protesting in front of the Saudi Embassy in Berlin fifteen times. Free Iraqis protest the Kingdom of Saudi Arabia cradling Wahabi Terrorism. They Protest terrorist ‘fatwas’ by Wahabi religious scholars calling for killing the innocent. The Wahabi fatwas have claimed thousands of innocent victims of children women and elderly. The protest was met with much sympathy and encouragement by passer-bys. The protest further condemns the Wahabi sect, its injustice and blood shed in its name its fatwa’s and condemning the Saudi Government for cradling Wahabi terrorism and its scholars who declare murderous fatwa’s. This protest received much support form passer-bys. The organizers of this protest sent a memorandum to the German Chancellor, chairman of the Parliament, heads of each of the four main political parties, all 614 members of the German parliament, 21 heads of smaller political parties and 19 human rights organizations working in Germany. 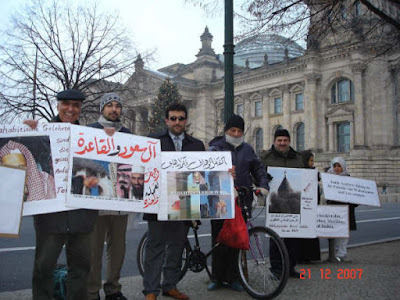 The memorandum appealed to the German Government and people to use all their capabilities to help stop the killing of innocent, stop desecration of Muslim and Non Muslim religious sights by putting pressure on the Saudi Government to relinquish its support of Wahabi terror (and their religious Fatwas) and terrorist groups who sponsor homicide bombers. The German text of the memorandum was written in the name of all terror victims in the world and in the name of all who value democracy and freedom. The memorandum then appeals to the German people and the Government to use all at its disposal to put a stop to the innocent bloodshed and terrorism in Iraq. The bloodshed and terror is blind and does not stop or distinguish between religions sects or national origin. Wahabisim is a particular extremist radical disturbance within Islam. Wahabisim is a state sponsored movement in Saudi Arabia. Wahabis declare all non Wahabis and those who do not think the Wahabi way to be unbelievers (most Muslims in the world are non-Wahabis) and thus (according to their ideology) must be terminated. This is how Wahabi scholars justify and call for and justify (through Fatwas) suicide bombers, terrorist groups such as Alqida. We want to tell the world of the terrorist danger of this movement and the teachings of it scholars. Wahabis with the support of the Saudi government are spreading their message of hate and killing in their schools. Through its teachings Washbisim sprouted Alqaida to which have fallen many victims of its violence and terror in New York, Bali, Madrid and London. These examples demonstrate the acute danger of the Wahabi mind set and its proliferation. These developments make it extremely necessary to confront this threat with tenacity. We thus appeal to you to exercise extreme pressure on the Saudi government to stop supporting the terror and bloodshed being called for by fatwa’s of Wahabis and to declare these fatwa’s illegal. This is not an exact word by word translation. It is a semi-detailed translation of the German memorandum and the article’s Arabic text. It is very interesting that citizens of one of the youngest democracies (yet oldest civilization) feel free and compelled to condemn terrorism in general and that in the name of Islam in particular. I believe Iraqis do so because they are free to express and condemn wrong doings. They do not fear some secret police coming into their homes, or that of their relatives, kidnapping and killing them. They also know that back home in Iraq the fight against these extremists needs much support both material and moral. le in how stringently they listen to or even condemn these Wahabi fatwas. Iraqis obviously free politically and protected by the rule of law have seen the dark ways of theses Wahabi fatwas particularly since they are on the receiving end of fatwas. Then there is Iran which brandishes its religious credibility through its scholars in Qum and Asfahan with the same self serving regard.